Yep, I’m one of those people that get excited about a certain pumpkin flavoured coffee that comes out every year around this time. But pumpkin can be used for so much more than pies and coffee. Are you looking to put an autumn glow in your family’s cheeks? 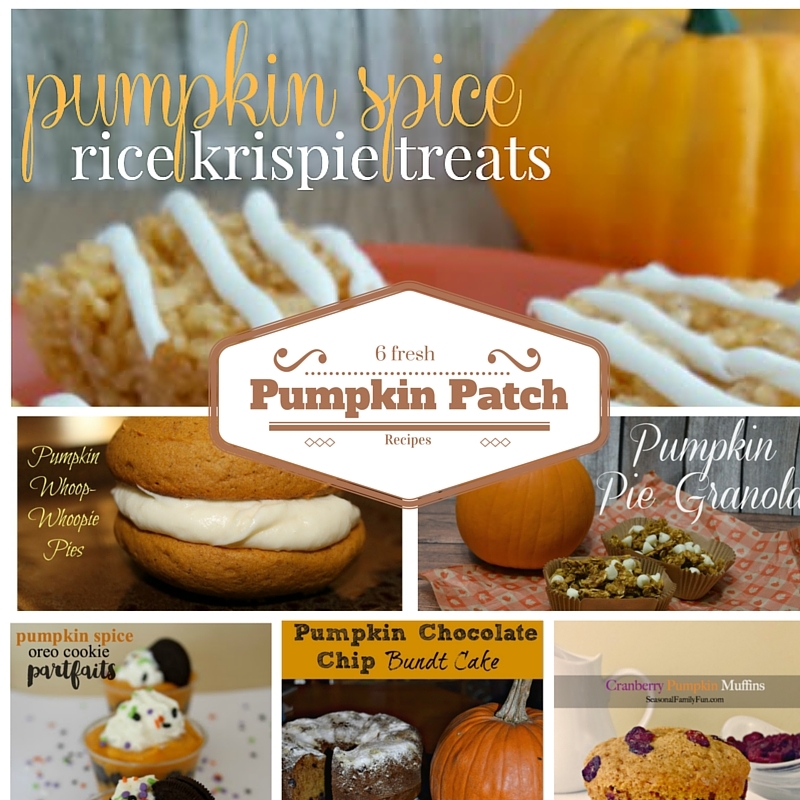 Make sure to click on the links and check out these scrumptious pumpkin recipes. 1.Pumpkin Spice Rice Krispie Treats are the perfect Fall treat for not only kids, but adults, too! Add this delicious twist to your rice krispies treats! 2. Pumpkin Whoo-Whoopie Pies -you can’t beat a classic cream-filled cake but this one gets a new twist! 3.Pumpkin Pie Granola – if you love a traditional granola recipe, then you will love this fall version that you can make at home. Granola is one of my favourite, and this version takes it to a whole nother level! 4. Pumpkin Spice Oreo Cookie Pudding Parfaits – I don’t know what is about chocolate and pumpkin flavours together but they are a perfect fall treat. 5. Chocolate Chip Pumpkin Bunt cake – Bunt cake is one of my favourite desserts. And this recipe is easy to make and tastes as good as it looks! 6. Cranberry Pumpkin Muffins– start your fall morning off the right way with these easy muffins. Nothing says fall quite like a warm batch of muffins. Which Pumpkin Recipes are your favourite? Thank you for sharing these, the rice krispy treats look delicious! These look so delicious! Not sure what to try first! Thank you so much for sharing it! These sound like Rice Krispy treats I would love!! I have been eating everything pumpkin I can possibly find! Pumpkin Rice Krispies sounds very tasty. We love pumpkin and I am always looking for new ways to use pumpkin in recipes. Omgoodness am I going to have fun baking this month – mmmm on the pumpkin spice rice krispies treats. I love cranberries and I love pumpkin so I think the cranberry pumpkin muffins sound out of this world. What a yummy combination. This time of year the world seems to go pumpkin crazy. Perhaps this year I will try a pumpkin recipe. This is a great list for pumpkin lovers! Lots of delicious treats! Oh those rice krispie treats could be a fun treat. I’d love to have some of those at the Halloween party. Oh hhi I am trying to pick a fave. It’s tough but I think I’m going to have to go with the muffins! Pumpkin is yummy. I love all of these recipes – they will keep me busy! I love the parfaits – so gorgeous! And of course, pumpkin whoopie pies are a big deal here in New England. I love this lineup. Pumpkin everything! All of these look heavenly! I would love to try the whoopie pies! I usually make a batch of granola each week for my kids’ after school snacks. I am going to have to try that pumpkin pie granola. I love all things pumpkin! That pumpkin granola sounds heavenly! Going to have to make a batch…or three! Yum! 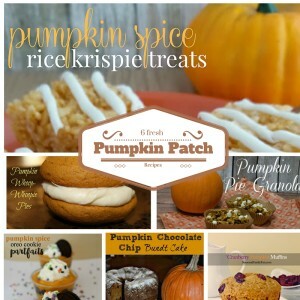 I’m all about pumpkin right now and these are some amazing recipes! I think I might just have to try out the whoopie pie one today! I want to make some of those whoopie pies! I love anything pumpkin flavored. So yummy! My daughter loves pumpkin flavored anything. Thanks for including my cranberry pumpkin muffins.